At an elevation of 3575m and it is a paradise for nature lovers also known as valley of flowers with a fascinating blend of flora and fauna and breath taking scenic grandeur. The valley is also the home of Shingbha Rhodendrons Sanctuary with 24 species of Rhododendrons. YUMTHANG HOTSPRING Yumthang is also known for its hot springs where travel sores can be soothed. It is immensely popular for its curative properties and healing power. Arrival at Bhadrapur / Biratnager Airport (Nepal) Transfer to Kurseong about 4 hours drive by luxurious vehicle. A journey to Kurseong is beautiful experience. The road passes through lush green forest, teagardens, mountain views, water falls, Mountain River and more. A complete journey to Kurseong a delightful experience simply out of the world. Kurseong (1486 m), it is nearest hill station, a quite township. A picturesque tourist resort, it provides excellent view of the southern plains. Over night at hotel in Kurseong. DAY-02- Morning Trip from Kurseong to Mangan (north Sikkim), 137kms about 5 hours drive, leading from Kurseong to Mangan one can experience mountain river sight. It is green forest and peace environment country sight. Lunch at enroute, continues drive to Mangan. O/ N at Hotel in Mangan. DAY-03- Trip from Mangan to Lachung (2600 m) 53 kms about 3 hours drive from Mangan. The road from Mangan to Lachung Shadows the Teesta River, going through dense forest. The journey from Mangan to Lachung is a soul refreshing experience. 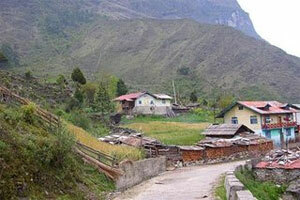 Lachung valley has as a tourist destination with the soaring popularity. Lunch at Lachung. Afternoon session: After lunch session, takes you to Buddhist monastery. Morning visit to Lachung monastery a famous monastery in north Sikkim, It is built around 1880; this monastery of the Nyingmapa sect is among the quietest in Sikkim. Situated amid apple orchids across the river from the town-center, it is framed against a range of snow-topped mountains. O / N at hotel in Lachung. DAY-04- Trip to Yumthang Valley (3575 m) 24 kms, 3-4 hours drive. The road leading from Lachung to Yumthang is delights of alpine forest. Yumthang valley is paradise for nature lovers, with fascinating blend of flora and fauna and breathtaking scenic grandeur, the valley is also the home Shingbha Rhododendron Sanctuary with 24spcies of rhododendron. Today we discover nature related activities around flower valley, Sight trip to Yumthang Hot spring: and nature related activities around Yumthang. Lunch enroute, return to Lachung valley. O / N at hotel in Lachung. DAY-05- Drive trip to Lachen (2750 m) 59 kms, 3 hours drive, surrounded by apple, Orchids and open scrubland inlaid with bunches of wildflower. O / N at hotel in Lachen. DAY-06- Trip from Lachen to Thangu valley (4090m) OR Gurudongmar Lake (5181m) about 2-3 hours drive. Gurudongmar lake is a considered as one of the sacred lake of this state both by Hindu and Buddhist. The lake remains milky in color through and it is believed that Guru Padmasambhava has touched the lake whilst he visited Tibet from this area. Explore Holly Lake, lunch enroute and drive to Lachen. O/ N at hotel in Lachen. DAY-07- Return trip from Lachen to down hill Mangan, 3 hours drive. O/ N at hotel in Mangan. DAY-08- Drive to Siliguri 5-6 hours drive, (for departure), O / N at hotel in Siliguri.